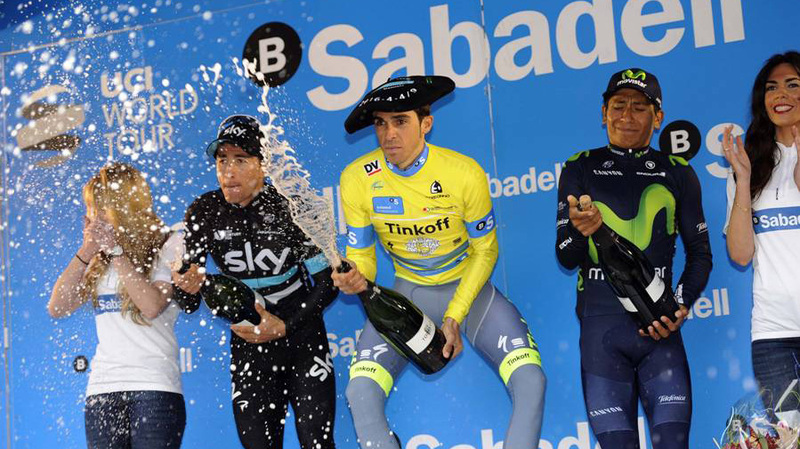 Contador could make it a record breaking five victories at Pais Vasco this week. We’re back in Spain for more climbing, although compared to recent years the profile of the week in the Basque country is not as intense. However, that’s not to say that the climbing will be any less fierce. The race begins in Pamplona, Miguel Indurain’s hometown. In fact, the first two stages take place here, the first is a nailed on sprint with a few categorised climbs preceding the final flat 30km. The second is a lumpier affair that will favour the puncheurs of the peloton. Stage three has a sawtooth profile too, with six categorised climbs and this should be the first testing day for the GC contenders. Stage four features two category two climbs, the final of them crested in the final 15kms. The GC fireworks will really take place on stage five, the Queens stage, which has six categorised climbs, three of them category one, including the summit finish climb up to the Sanctuary of Arrate. Depending on the time gaps after this, the final stage time trial could see the GC race go down to the wire. Despite the fact that there is less climbing in this year’s race, it has still attracted some of the best mountain goats of the World Tour. Record-equalling four-time winner of this race, Alberto Contador is the defending champion and has looked on great form, finishing second at Rut del Sol, Paris-Nice and Volta Catalunya, the reduced climbing will suit his explosive style and he could finally make it to the top step of a week-long stage race in 2017. Alejandro Valverde and his Movistar team owned Volta a Catalunya. He was riding with the power of a rider 10 years his junior and it was a sight to see. If he brings the same form here then he’ll be extremely hard to beat. 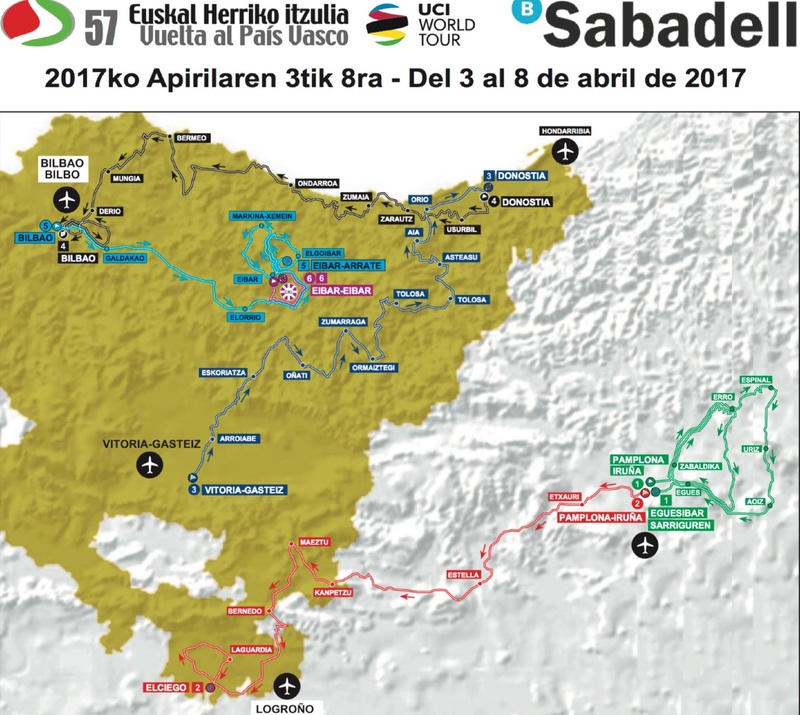 Daniel Moreno and Gorka Izagirre will be his main support, Moreno could also fancy a stage win on one the punchy stage 3. The rider that beat Contador to the Paris-Nice title, by two seconds, was Sergio Henao. This was the realisation of years of promise from the Columbian and it was good to see him put behind him the issues he had to off the bike over the past few years. Sky also bring inform classics rider Michal Kwiatkowski who will now be fine tuning himself for the Ardennes with a stage win in mind. Julian Alaphillpe had a fantastic Paris-Nice. he raced aggressively throughout and won the mountain time trial on Mount Brouilly. He came untick on the high mountain top finish on stage 5, but the lack of long climbs here will suit him down to the ground and he will be in the mix for the GC fight. Gianluca Brambilla and Maximiliano Richeze will be targeting stage wins on the lumpier and flatter stages respectively. Simon Yates followed up his stage win at Paris-Nice with victory in the Gran Premio Miguel Indurain last weekend. He is another rider that will favour the lack of long mountain climbing. With the Giro only a month away he’ll want to compete for the Gc rather than just pick up a stage win. Simon Gerrans and Micheal Albasini will play the role of stage hunters for the week. Rigoberto Uran hasn’t raced for a month. He was competitive at Tirreno-Adriatico. For the past five years, he has favoured Catalunya over Pias Vasco, so it will be interesting to see what he can do here, as he’ll be fresher than the other riders. The final stage TT could be his undoing, as he hasn’t shown in this discipline for a number of years. Romain Bardet has rejigged his race program, following his DQ from Paris-Nice. He is another rider that is suited more to the longer, high climbs, but he won’t be easy to shake off when the attacks start to fly. His teammate Alexis Vuillermoz will be better suited to the punchy climbs and will likely be aiming for a stage win after a slow buildup so far this season. Primoz Roglic is looking to have a real breakout year in 2017. He took a surprises win at the Voltas ALgave and was fourth overall at Tirreno-Adriatico. The final stage time trial will really suit him, as will the lack of big climbs. He could be in line for another big scalp here. Our Pick for GC: Julian Alaphillipe. He was on fire at Paris-Nice, but the climb to Col de la Couillole killed him. With not such brutes on offer here, the flattish time trial is his biggest challenge, but we think he can overcome that and take his first European GC win here. No daily previews for this one, as we’re away in Mallorca getting some climbing miles in the legs! We’ll be back forParis-Roubaix.